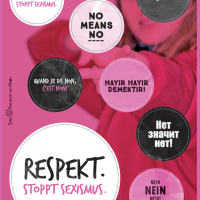 Ob auf der Straße, in der Bahn, im Jugendclub, in der Klasse oder im Büro, die aktuelle Kampagne „Respekt. Stoppt Sexismus“ des Frauenreferates der Stadt Frankfurt ist vielerorts in der Bankenmetropole präsent. Wichtige – und coole – Elemente dabei sind Sticker und Swingcards. “We all Share the Same Dreams” is the theme of the European Commission campaign on LGBTI. It focuses on the things that unite us rather than divide us by featuring different people sharing the same dreams. The campaign forms part of a larger LGBTI action plan of the EU. Zehn Jahre nach Inkrafttreten des Allgemeinen Gleichbehandlungsgesetzes (AGG) legt die Antidiskriminierungsstelle des Bundes eine Evaluation vor und spricht sich für eine Reform des Gesetzes zum besseren Schutz vor Benachteiligungen aus. Arbeitsplatz- und Konsumthemen stehen dabei nicht im Fokus. It took many years until the issue of discrimination against Roma, Sinti and members of travelling communities was acknowledged as a Pan-European phenomenon. In a new report, the European Commission assesses progress against the 2013 Council Recommendation on effective Roma integration measures. Companies could contribute as part of their Diversity work. A new web portal offering resources on gender and science, covering multiple interest areas and resource types, will be formally launched on 21st April 2016. The GenPORT (www.genderportal.eu) Internet site aims at pooling information on projects, events, organisations and individuals involved in gender in a science context. The European Commission must table a communication on a new strategy for gender equality and women’s rights 2016-2020 as soon as possible and deliver on its political commitments, Members of the European Parliament say in a recent resolution. It is the latest visible element of a discussion the two EU bodies have had for a while. Based on current representation data, the Dutch government is likely to extend its gender targets for women on company boards to December 2019. The bill which applies for 4,900 companies is currently discussed with relevant bodies in the Netherlands. It aims at having at least 30% men and 30% women on executive and supervisory boards.